Home Back to Animoe ¿Hablas Español? 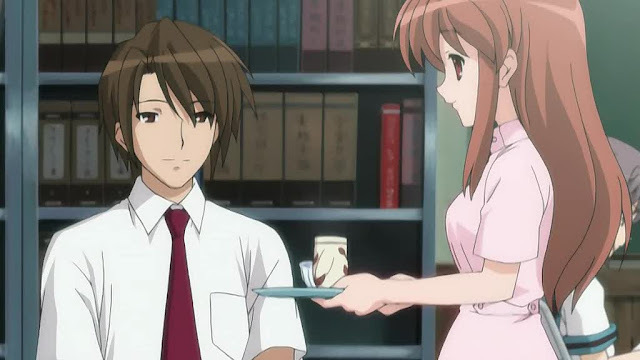 Kyon is an ordinary freshman high school student who has recently given up his fantasies of espers, time travelers, and aliens as he left middle school. All that changed one day when Haruhi Suzumiya, a young and very active girl, introduces herself to the entire class saying: "I have no interest in ordinary humans. If there are any aliens, beings from the future, or people with supernatural powers, come see me. That is all!" 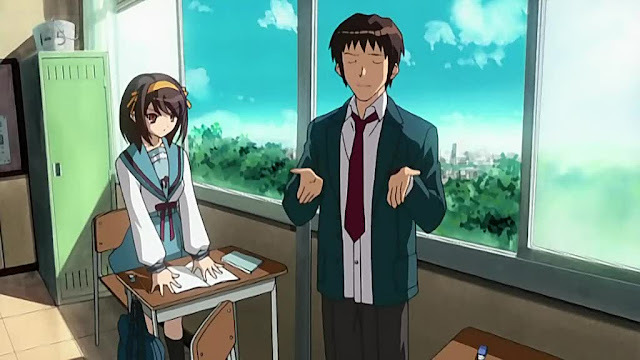 Kyon, who sits right in front of Haruhi, has drawn his attention to this strange introduction and gradually begins to interact with Haruhi, setting off a chain of events which drag him into surreal situations. 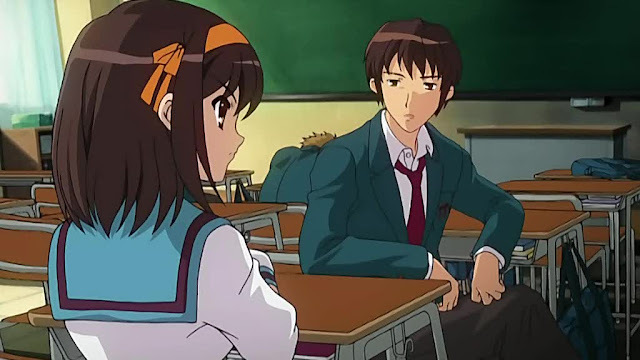 Although Haruhi is perfectly good in everything she propose, She joins and quits every club in the school, finding only dissatisfaction, until Kyon makes a snide remark about her actions and accidentally provides Haruhi the enough inspiration to create a club of her own, which will be called called: The brigade S.O.S., a club dedicated to finding just aliens, time travelers and spers. 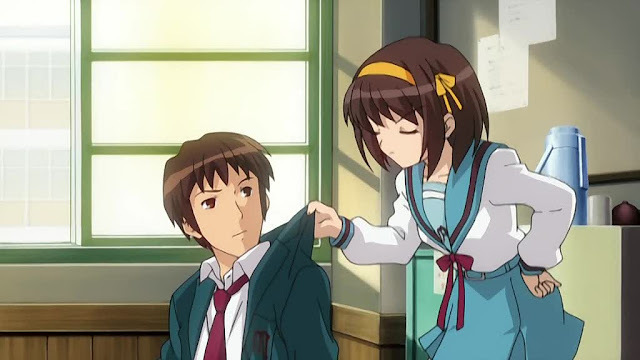 To help start the club, Haruhi forcefully drafts Kyon, who only stays in the club to protect other helpless victims of Haruhi's "voluntary arrests". 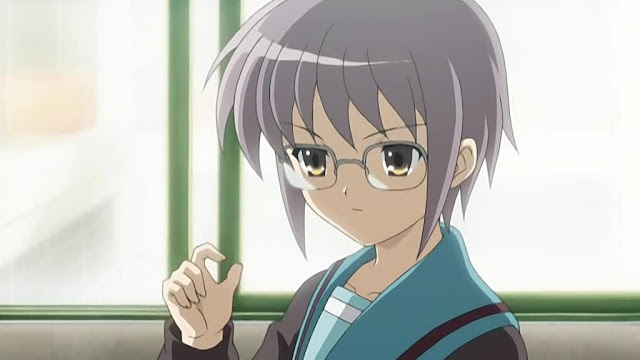 Thus, the first of these new members is Yuki Nagato, a silent bibliophile who usually wants to simply be left alone to read; Mikuru Asahina, a shy and timid student, who is one year above Haruhi and Itsuki Koizumi, who is almost always smiling and more than willing to give in to Haruhi's strange demands. 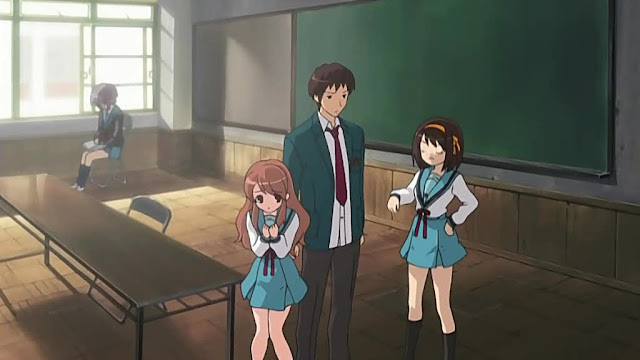 Except for Kyon, the members of the club are secret agents of various organizations who are sent to observe Haruhi. This way, Yuki is in fact a "human interface" (an alien), Mikuru is actually a time traveler and Koizumi turns out to be one of many espers in an organization known as the Agency. Haruhi unknowingly, is surrounded by precisely the sort of people who have sought to find. Kyon, who perhaps is the least crazy of all, is drawn further into a world eerily like the fantasies he had just managed to outgrow, with Haruhi at its center. Suzumiya Haruhi no Yuutsu, is an excelent and superb show that i enjoyed a lot. I entire like the way how the story is told from the point of view of Kyon, with his toughts and remarks instead of Haruhi's (the central character of the plot). I also liked the way how every character relates with Kyon and all the crazy adventures. Yuki and Mikuru are great (animation and drawns) and they make to wish to see more in the show. There's a lot of fans out there devoted to Yuki and Mikuru as well as Haruhi's. While some fans recommend seeing a specific episode order of the show, I saw it and prefer to see it in the order it was broadcasted, because I think it lets you go slowly discovering the story without making the plot as sequentially. It is rumored a second season of the show. a second season? i hope its true. i thought the first season had an abrupt ending.